The Secret Report deep-dive has now been fully translated thanks to @lunesacree. In this section, each Secret Report is laid out, followed by a commentary. Be warned there will be heavy spoilers beyond this point. When I awoke, I found myself in a cell. Afterwards, the researchers attempted to learn just who I am. The only joy I've had since coming here is conversing with the two boys who come sometimes. Then, one day, someone came to take me out of the cell. In the dim light, I saw that the man was one-eyed. Though several years have passed, still now, I know not who I am. Ultimania Commentary: The writer is a girl known as "Subject X", who was being used as a test subject in Ansem the Wise's castle. She is the same girl being sought after by Ansem SOD, as well as the girl Axel and Saix spoke of. - "Four friends, a key...": The wording insinuates a deep relationship between four friends and a "key", the Keyblade. The saying "May my heart be my guiding key" is connected in that it implies she is someone who came from the ancient past. - "The two boys who come sometimes": Lea and Isa, who lived in Radiant Garden. In order to see her, they slipped into the castle (see Report #6). - "I saw that the man was one-eyed": If we're speaking about one-eyed men who were in Ansem the Wise's castle, Braig (as Xigbar was known during his human days) springs to the forefront of your mind. He became one-eyed during the events of KH BbS, and was around during the same time Lea and Isa were sneaking into the castle. Some days have passed since I set out on my journey to visit faraway worlds for the Mark of Mastery Exam. I had hoped for Eraqus to come along with me, but I was to go first. It is a journey to the worlds of fairytales that I had seen in books. I, who had been raised in a world surrounded by water, and dreaming of the outside world until just a few years ago, set out from my home, guided from the future. And on my journey towards Master, I came into contact with several darknesses. Ever since those days, I thought that if darkness was able to be controlled, it needn't be feared. Eraqus, who carries within him the blood of Masters from the age of fairytales. I don't want to be someone who chases after his silhouette, but instead stands shoulder to shoulder with him as an equal. In order to face him (note: the kanji here is "oppose" or "antagonize"), I will need the power that is discovered from the balance of light and darkness. Ultimania Commentary: This is a report the young Xehanort wrote before becoming a Keyblade Master. It shows that while he was forming the ideology around things like "if darkness was able to be controlled, it needn't be feared" and "I will need the power that is discovered from the balance of light and darkness", he also showed the purehearted desire to mutually improve together with his best friend, Eraqus. - "Eraqus, who carries within him the blood of Masters from the age of fairytales": It is revealed that Master Eraqus is descended from the first Masters. Furthermore, according to director Tetsuya Nomura, these "first Masters" are people in the Dandelions who appear in KH Union Cross, and aren't related to the Master of Masters or Foretellers who appear in Back Cover. Female, around 15 years old. Found early in the morning in the central plaza. After 7 days, she was able to speak, but is amnesiac and cannot remember her own name. Seems concerned about which world this is. Her words seem to indicate she had friends with her. Though she cannot remember her companions' names, it seems she was separated from them in her previous world. Shows a rejection response when attempting to recall those memories. After the first experiments that were done when my master, Ansem the Wise, brought me, who had lost my memories, in as an apprentice, he came to fear something and the experiments were ceased. However, would those experiments not be effective on this girl, who, like me, has lost her memories? Depending on the investigation into the heart, it's possible to touch those memories. Using myself as the test subject, I will get those memories back. Learning just who this girl is, and where she has come from, is deeply fascinating. "May my heart be my guiding key"...is what I'm sure she muttered. Ultimania Commentary: Like Report #2, this was written by Xehanort, but Reports 3 and 4 were written during his time as an apprentice. His investigations of Subject X are written here. As before, her memories do not return, and our conversations continue with no indication that they ever will. Her stories sound almost like a world of fairytales. Though it's difficult to imagine so, just from the fragments I get from her speech, it's possible she has traveled through time. If this is true, the urge to peek into her heart is uncontrollable. During initial testing, there were several candidates on whom tests were performed, but all of their minds became unstable and collapsed. There is a chance the girl could be a special test subject. In the midst of everything, my master, who had repeatedly performed tests on several subjects, stopped his research, tore up the results and harshly berated me. Not only that, but upon the release of many subjects, the girl also disappeared. Is my master hiding her? However, I will not cease these experiments. With myself as the first subject, I will begin the true experiment. Ultimania Commentary: The second part of the observation reports apprentice Xehanort wrote on Subject X. He is told [by her] that it seems she has traveled through time from the age of fairytales. - "All of their minds became unstable and collapsed": This shows the reality of what happened when Xehanort continued his human experimentation and created many sacrifices out of the test subjects. The cruelty of his actions are also written about, partially, in the secret reports of KH1. - "Is my master hiding her? ": This is ultimately the way Xehanort interpreted the situation, and Ansem SOD later asked Ansem the Wise [about it] with this as the basis. Actually, as is written in Secret Report #1, Braig is the one who took Subject X away. To us, as children, that castle was fascinating. Inside, Ansem the Wise performed various experiments, and under his blessing the people lived in peace. Just that was enough to drive our curiosity, but beyond those closed-off walls, dark rumors existed. Night after night, the sound of what seemed like peoples' moans could be heard. Dangerous human experimentation was being done. Together with my best friend Lea, we hatched a plan to investigate and sate our curiosity. First was slipping past the brawny gate guards, who, from their appearances, you would never guess were also researchers. Sure enough, we were quickly found, and the days we spent getting thrown out of the castle continued. Finally, on the day we managed to infiltrate, at the bottom of a spiral staircase deep within the heart of the castle, we found rows of cells stretching on into the darkness. Without even knowing if anyone was in those cells, and unable to call out to anyone, we definitely felt someone's presence and regretted having snuck in. Just as we were about to turn and leave, however, we felt that a tiny voice called out to us. Following that terrified voice, we found a girl, her faintly shining light glowing. Ultimania Commentary: Saix's memoirs about his boyhood days as Isa. You can read about how, to satisfy their curiosity, Isa and Lea snuck into the research castle and met a mystery girl (Subject X). - "The brawny gate guards": This is talking about Dilan and Aeleus, whose jobs were to keep watch. During the ending of KH BbS, you can see them throwing Isa and Lea out of the castle after finding them there. The light was dim, so we couldn't clearly make out the girl's features. Concealing our voices, we tried speaking with her, but she had lost her memories. Why was she locked up in this place? Even that, she didn't know. Even so, I thought that I wanted to save her. From that point on, our attempts to sneak in and the times we were thrown out grew more frequent, and at times we succeeded and spoke to the girl. As we were yet children, that was about all we could do to help her. As this continued, Lea and I decided that we were going to rescue her. With the single-minded intent of saving her, we snuck into the castle. However, though we snuck in over and over, we never saw that girl again. Was she just an illusion? Lea and I launched a mission to search for her. Today we stand before the castle guards, with the intent of becoming Ansem the Wise's apprentices. Ultimania Commentary: The second part of Saix's memoirs talking about his exchanges with Subject X. It is revealed that Isa and Lea joined Ansem the Wise's ranks of apprentices in order to search for Subject X. - "With the single-minded intent of saving her": Though Saix gives a fairly cold impression, when he was young he had a passionate side that he acted on as well. He thought that joining Xemnas's side would give him a shortcut to saving Subject X. Perhaps due to the great damage as a result of being erased as a member of Organization XIII, I did not regain consciousness right away. Even when I did wake, I remained lying on the floor a while, thinking about what I should do. During my time with Organization XIII, I readied 20 replicas. Initially, there were many failures not even deserving of a "No." title, but from the batch, the first success, Replica Riku, was born. With the creation of No.i, Xion, a mostly humanlike state was achieved, but her appearance was unstable and changed based on her relationship with those who interacted with her. Using those two as the base, I created a number of incredibly lifelike replicas, but just before their completion, my work was interrupted. My guess is that Xehanort is using both the initial batch and those that came after. Today, I went out for a walk to the plaza for the first time in a while, but "he" appeared to make an unexpected proposal. Though quite a bit younger than I, he is a man who serves as Xemnas's advisor (note: the word used here is "staff officer" or "military staff"). I accepted that proposal and became a Nobody once more. It will be convenient to use the Replica Project of the past. All is for the sake of atonement. Ultimania Commentary: A report written after the recompleted Even (Vexen) became a Nobody once more. Pay close attention to the details of his greatly important research, the Replica Project. Additionally, it is written that Xemnas's advisor—Saix—offered Vexen the proposal for the sake of atonement. - "The great damage as a result of being erased as a member of Organization XIII": This is talking about the part in KH CoM where Axel uses his flames to burn and destroy Vexen. When a Nobody is defeated by an attack, their recompleted body suffers the damage. The Real Organization XIII is the name generally being used for Xehanort himself and his 12 vessels. As the numbers needed for the plan are already sufficient, Demyx and I have been sidelined. There are a few others from the old Organization headed by Xemnas who, like me, chose to become Nobodies again after their recompletion as humans, but Xemnas himself is ever an exception. At present, the real Xehanort, who is an old man, leads the Real Organization XIII. As he is a human, his Heartless and Nobody, who were defeated in the past, as well as the youngest Xehanort, do not truly exist in this time. They make use of the prototypes I once created as vessels, with their hearts being torn from the moments they existed in the past. Xehanort has ordered me to improve these prototypes so that they achieve a more humanlike state. This is also a good opportunity for my atonement, by completing replicas that will be the vessels for flesh and blood humans. I will have to think of how to give those vessels to "them" afterwards. Ultimania Commentary: The contents of Vexen's observations on the structure of the Real Organization XIII. The ones who "do not truly exist in this time" are called as such because their bodies are Replicas, and their hearts were called from the past. - "Replicas that will be the vessels for flesh and blood humans": This is talking about the progression of Vexen's research, but also one of the aims he entrusts to Sora and friends. In the story, with the help of Demyx, the vessel that is brought before Ienzo is used for Roxas. This is my conclusion after having seen all of the data that my master entrusted to Riku. 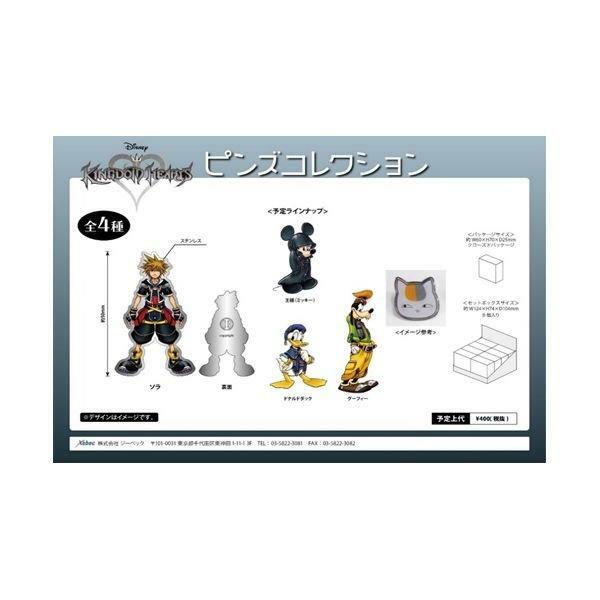 Within Sora's heart are three boxes, each storing three respective hearts. The first is Roxas. The second, from around the same time as Roxas. The third is from a time before. 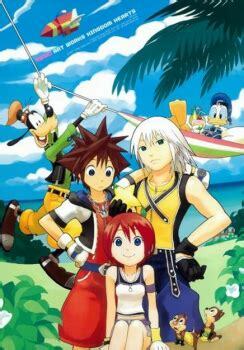 Those three hearts are silently melded into Sora's. Potentially removing those hearts, physically speaking, poses a danger similar to when Sora once became a Heartless. First, the heart must be placed into a vessel to store it, and then that vessel must be awakened. The best method would be retrieving the bodies of those people to use as vessels, but the case of the others is unclear, and Roxas has no human body. Namine, who is likely contained within Kairi's heart, is the same. As long as there is a body, all that is needed is some catalyst to return the hearts from Sora into the bodies. The catalyst is the person who ties all of their hearts together. As turning a heart completely into a data is impossible, the hearts can only be restored in pieces. Although the the real hearts inside Sora are necessary, their memories can be completely reconstructed using the data Twilight Town. For Roxas and Namine, who have no physical bodies, this data is of great importance. Ultimania Commentary: A report written by Ienzo while analyzing the Ansem Code. He writes about the three hearts inside Sora's, and the way to potentially safely restore them. - "The first is Roxas. The second, from around the same time as Roxas. The third is from a time before. ": Roxas, one from around the same time as him, which is Xion, and the third from before Roxas, which is Ventus. By the way, there is only a seven-day gap between when Xion's heart returns to Sora and when Roxas's heart does. Replicas can be thought of as replacements for bodies. Their data can be pulled from the data of Twilight Town and placed into these empty vessels. From their memories, the vessels will take their shape, changing into something very close to a human body. 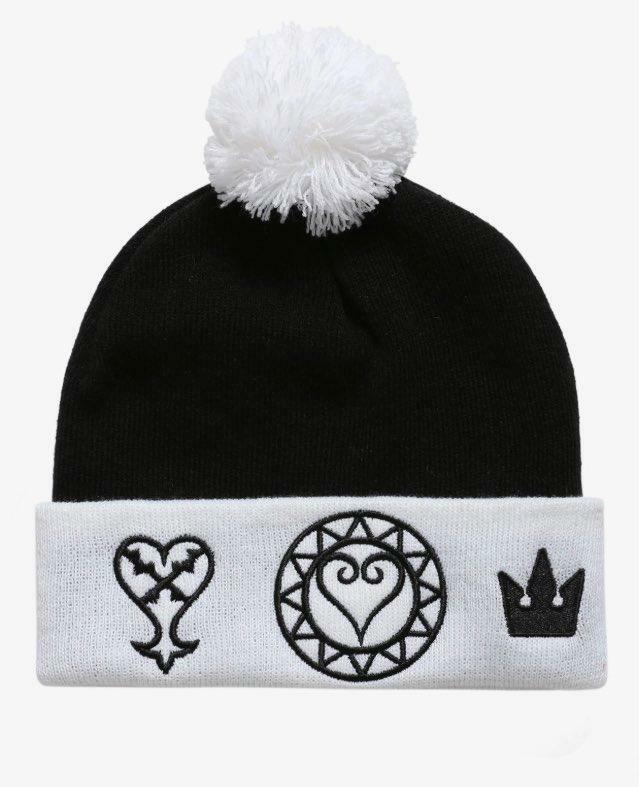 The final key is the sleeping hearts inside of Sora. For their bodies to be born, as long as there is a catalyst to shake them from sleep, it's likely their hearts will return to their own bodies. Replicas...they are innovative ways to serve as someone's vessel, but they weren't supposed to have been completed yet. What's more, Even, who plays a crucial role, has gone missing. If we're supposing Roxas, Namine, and the other remaining person will have bodies, at the very least three replicas will have to be prepared. Either way, it's a difficult problem, but analyzing my master's data like this reminds me of the taste of the ice cream we always used to eat together when I was a child. Instead of regretting my betrayal, I must work towards restoring those two [Roxas and Namine], and proving my master's true intentions. Ultimania Commentary: Writings about the plan to use Replicas to revive Roxas and Namine. It is a plan that would make a complete Roxas by using the data from Twilight Town, and then taking Roxas's heart from Sora's. - "...reminds me of the taste of the ice cream we always used to eat together when I was a child": Ansem the Wise's favorite, sea-salt ice cream, was also often eaten by Ienzo when he was very young. You can see the both of them walking and eating ice cream together in KH BbS's secret event "Blank Points". As is written on the Lost Page, I have seen the Keyblade War through. Next is to pass down the Keyblade entrusted to me by the Master. Of the Dandelions left alive, five have been chosen as the Union Leaders. I will hand down the Keyblade to one of them, and watch over this fate. However, it seems someone has secretly infiltrated the chosen Union Leaders. An exception who wasn't chosen by the Master. A virus who seeks to sneak into the program written by the Master, as it were. This virus has begun their strange machinations. They plan a reckless escape of the Five to another worldline. but I doubt the boy and the others, who are not even masters, can pull it off. It seems that a witch invited here [purposely] from the future holds the key. Regarding the Union Leaders, I had thought there would be a much simpler plan, but is this, too, the doing of the Master? Ultimania Commentary: Reports 11-13 are written by Luxu, one of the Master of Masters' apprentices who appears in Back Cover. They are fully loaded with information that has a deep connection to what's coming next in the KH series. - "As is written on the Lost Page, I have seen the Keyblade War through": The Lost Page is a page that was intentionally left out of the Book of Prophecies, whose contents extremely few people know. - "It seems someone has secretly infiltrated the chosen Union Leaders": The five Union Leaders in KH Union Cross are Ephemer, Skuld, Ventus, Brain, and Lauriam. However, Ava, acting under orders from the Master of Masters, was supposed to have chosen a girl named Strelitzia. Whoever took her place is currently unknown. - "A witch invited here from the future holds the key": The "witch" is Maleficent. In KH1, when her heart is released by Ansem, she realizes the conditions for time travel she heard from Master Xehanort some time in the past and travels to the ancient past. Even if there is a worldline without a Keyblade War, it isn't as if there is peace. After the disappearance of the Master and we apprentices, "darkness" appeared. With the rise of darkness, the end of the world is again approaching. Amid this confusion, as the Master instructed, I passed down the Keyblade to one of the Union Leaders. Along with this sacrifice, the Five have been sent to another worldline. With this, I imagine the lineage of Keyblade wielders will be preserved. I, who have lost my Keyblade, must also depart this land in order to fulfill my final role. I will discard my body and place my heart into another vessel. And I will watch over the ages, proceed to the next era, and someday in the coming ages, perhaps in the separate worldline where the Five were sent, some several years, some dozens of years, or some hundreds of years later, I will meet them again. Somewhere in the history of the passing down of the Keyblade, a "chosen one" who will reenact the Keyblade War will appear. When this chosen one takes the "Goat of Atonement" Keyblade in hand, I will once again act to fulfill my final role. The Lost Masters will awaken. Ultimania Commentary: It is written that the five Union Leaders are sent to another worldline, as even the worldline without the Keyblade War will meet its end. Luxu, at this point, discards his original body. - "I passed down the Keyblade to one of the Union Leaders": The Keyblade Luxu had was entrusted to him by the Master of Masters, and is considered the oldest Keyblade. In the text it is called the "Goat of Atonement" and was passed down through the ages until it was given to Master Xehanort. It seems that this body and name will be my last. The Keyblade has been handed down through generations, one by one, and at last it seems a Keyblade Master devoted to darkness will be born. Until now I have watched the Keyblade from far away, but it seems I must now take to the stage. All I have to do is pretend to be a fool who wishes for the power of the Keyblade [from up close]. As his accomplice, I will be at his side and watch over my Keyblade. The Keyblade entrusted to me by the Master of Masters. The Keyblade that was created with the Master's eye that links to the future, and through that eye, the Master can see the future. To change my body and watch over this Keyblade through the ages is also my role. It has been a long time. It has been an unimaginably long road. At last, in this era, the Keyblade War will wage, and Kingdom Hearts will be opened. A true Kingdom Hearts, born from the clash between light and dark. The reunion with those I once called my friends is near. Thereby, my role will be realized. Ultimania Commentary: A report written by Luxu, as Braig, when he realized that, after witnessing Master Xehanort's rise, the Keyblade War would happen again. It's confirmed once again that the Master of Masters can see the future through the Keyblade he passed to Luxu. - "All I have to do is pretend to be a fool who wishes for the power of the Keyblade": You can see the moment Braig and Master Xehanort come into contact in KH BbS. Did this help to solidify your understanding of the reports? Lets us know in the comments! Kingdom Hearts III is now out worldwide and the community aren't holding back with their excitement. The game is now trending on Twitter and Twitch! Earlier this morning, Kingdom Hearts III had the most viewers on Twitch even beating Fortnite! Since then, the game has dropped to number two, being beaten by League of Legends but this is still a big moment for the Kingdom Hearts franchise. We hope everyone is enjoying their first experience with the game. Head on over to our forums to discuss all things Kingdom Hearts III! Not everyone is as musically inclined, and may have missed it. I noticed it too myself but it's worth having it out there for those who didn't. A discovery has been made in a tweet from helloneet on Twitter. Helloneet tweeted a video showing himself playing Face My Fears on piano and discovering that it uses the same chords as the original Kingdom Hearts' Dearly Beloved! "Face My Fears" is available worldwide; the album song can be bought from the Apple Store, Google Play Music, and Amazon as well as streamed on Spotify. For lyrics and more information, click here. The Face My Fears EP just reached number one in the iTunes International Album chart, you can find out more about this here. How do you feel about Skrillex' enthusiasm towards Utada Hikaru's music? Share your thoughts in the comments below! The World Music Awards Twitter account has announced that Utada Hikaru's latest EP, Face My Fears has rocketed to number one on the iTunes International Album chart; only a day after it's release! The EP contains the Kingdom Hearts III opening song Face my Fears in both English and Japanese, as well as the English ending theme, Don't Think Twice and its Japanese counterpart Chikai (誓い). Are you glad to see Utada's music receiving so much attention? Let us know what you think of the songs in the comments below! This experience will return twice more after the games Japanese release; Saturday January 26th - Sunday January 27th and Saturday February 2nd. Once again, these will take place from 12pm until 7pm. All times are JST. Will you be attending this event? We'd love to hear about it! Lets us know in the comments below! 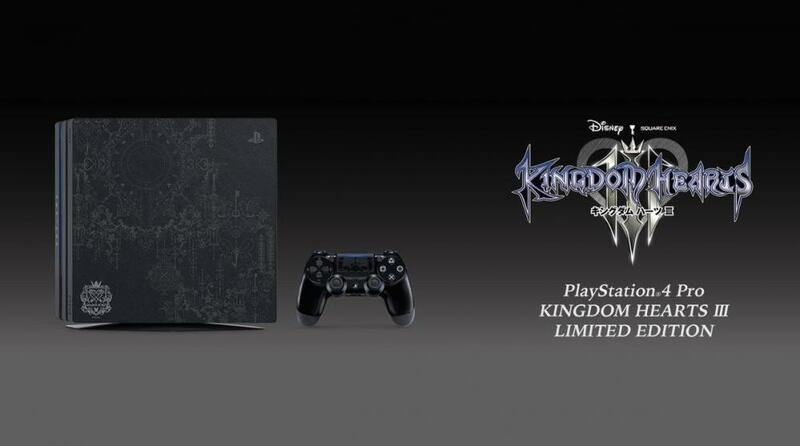 The limited edition Kingdom Hearts III PlayStation 4 Pro console has slowly been getting announced for more and more regions and now Spain is getting added to the growing roster! GAME España have posted a tweet stating pre-orders will go live on Tuesday 8th January at 4PM. More information will be revealed at some point on the 8th according to the tweet. Are you going to pre-order the console? Let us know in the comments! We're at the end of another month and that means it's time for a new round-up for all of Octobers merch! 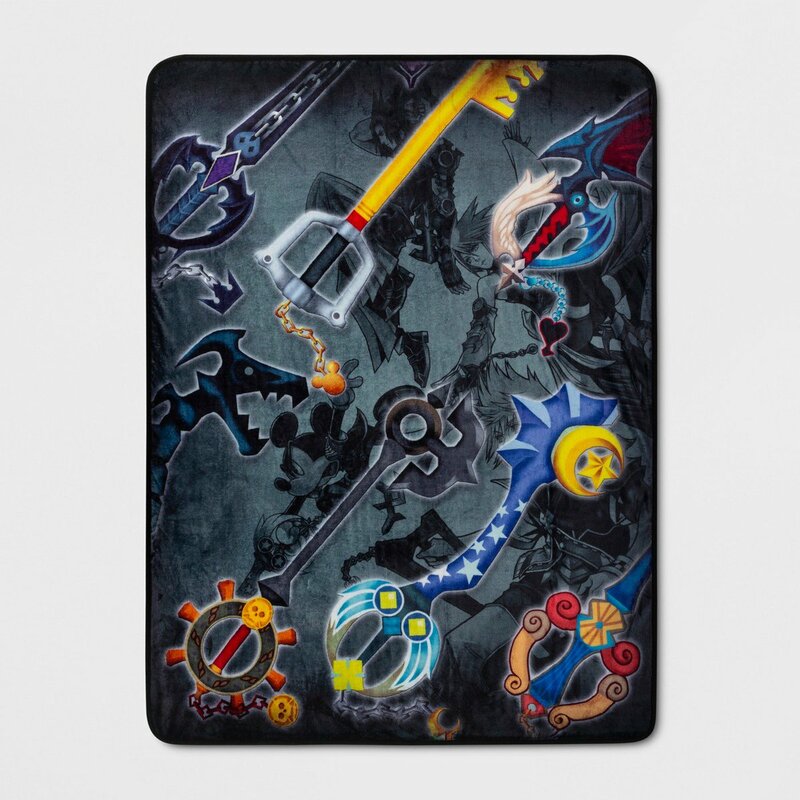 First up we have a new Kingdom Hearts throw being sold by Target. 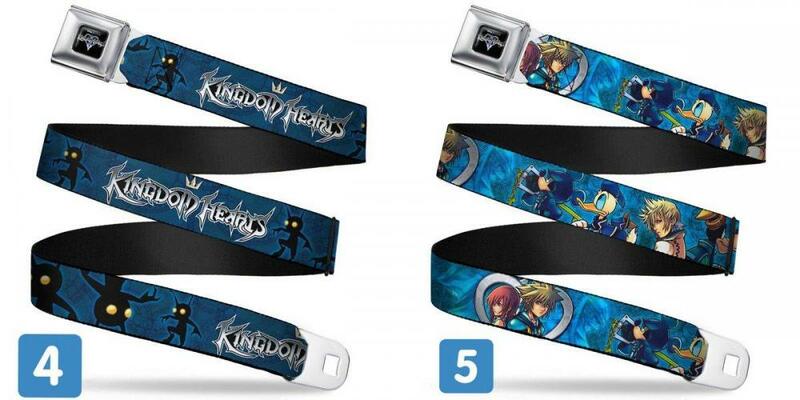 The throw feature multiple Keyblades from the series! The throw is retailing for $19.99. 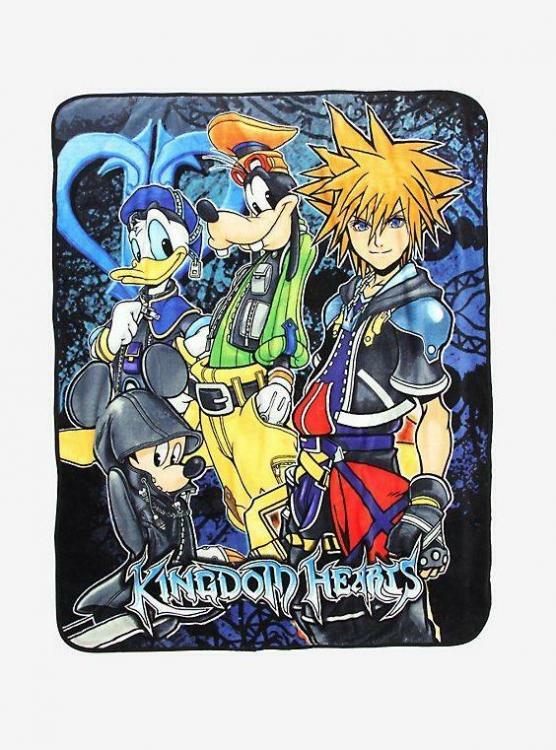 Hot Topic also have their own Kingdom Hearts group throw blanket for $24.90. This throw features Sora, Donald, Mickey, and Goofy. Next up from Hot Topic are 2 Funko Pop! 's; the Soldier Heartless and Kingdom Hearts III Sora, both retailing for $12.50. 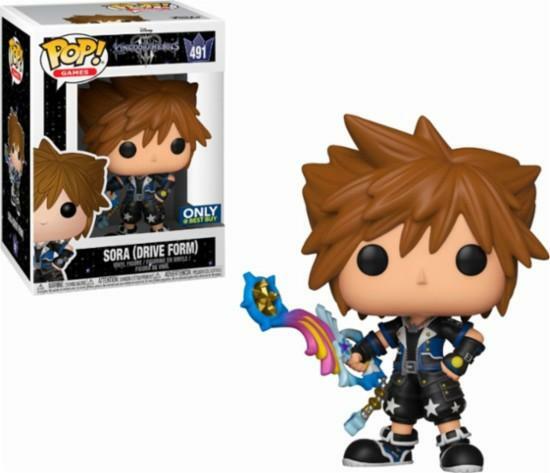 Best Buy are now listing the Kingdom Hearts III Sora (Brave Form) Funko Pop! as coming soon with a current release date of 23/11/18, though this is subject to change. The currently listed price is $9.99. Diamond Select Toys had new Q&A where they answered multiple questions regarding new and planned Kingdom Hearts products. 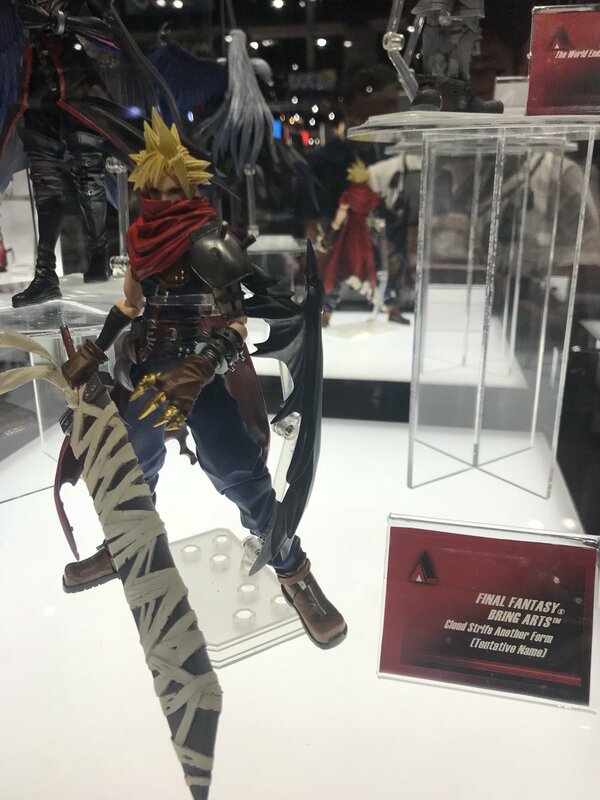 The first thing they mentioned is that a new Roxas figure was a the top of the list for the Gallery line, as long as they continue to sell. 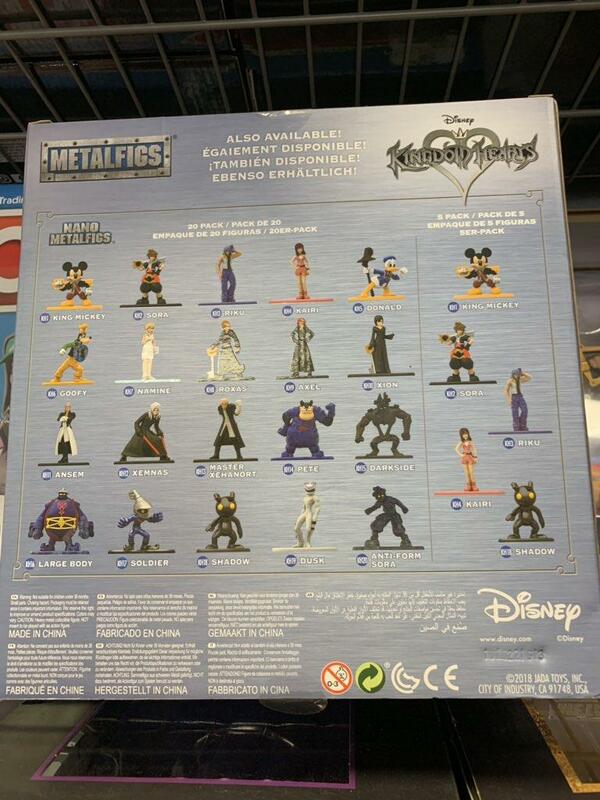 There will also be more Organisation XIII members and new Keyblades! 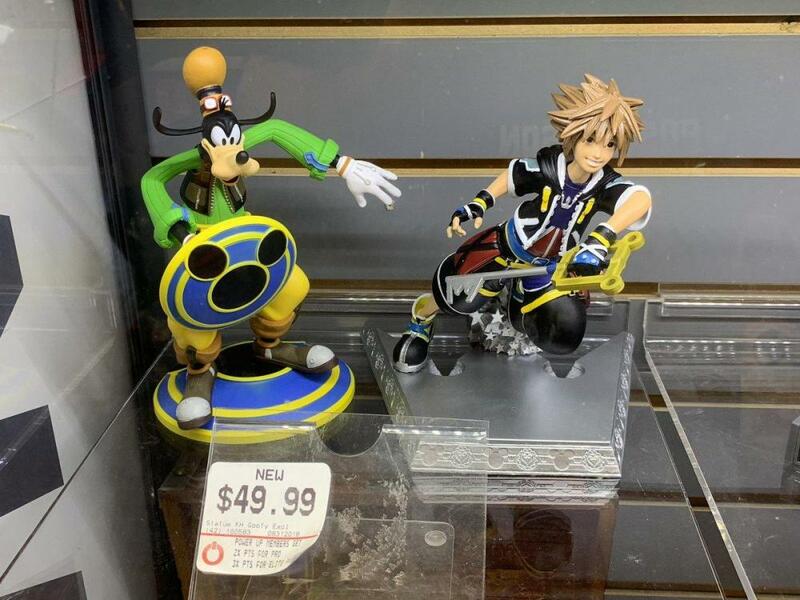 Diamond Select Toys have also released new Sora and Goofy figures for $49.99! 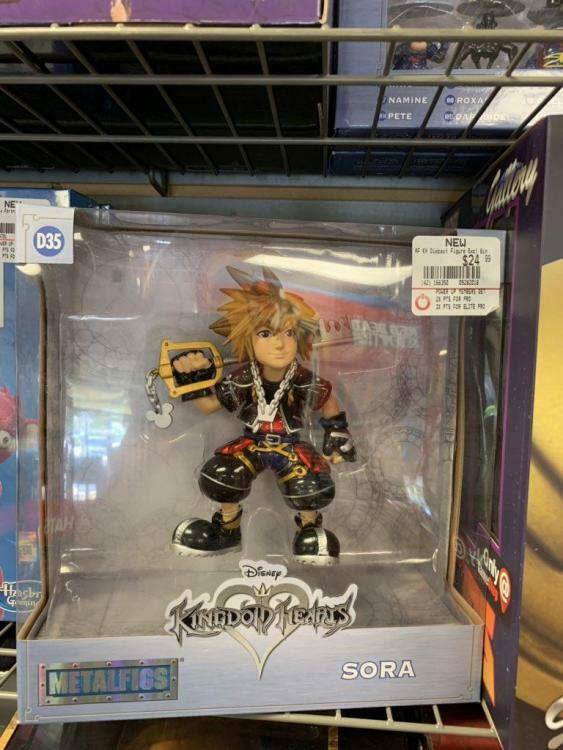 A Sora MetalFig figure was spotted by Churro at GameStop in-store for $24.99. 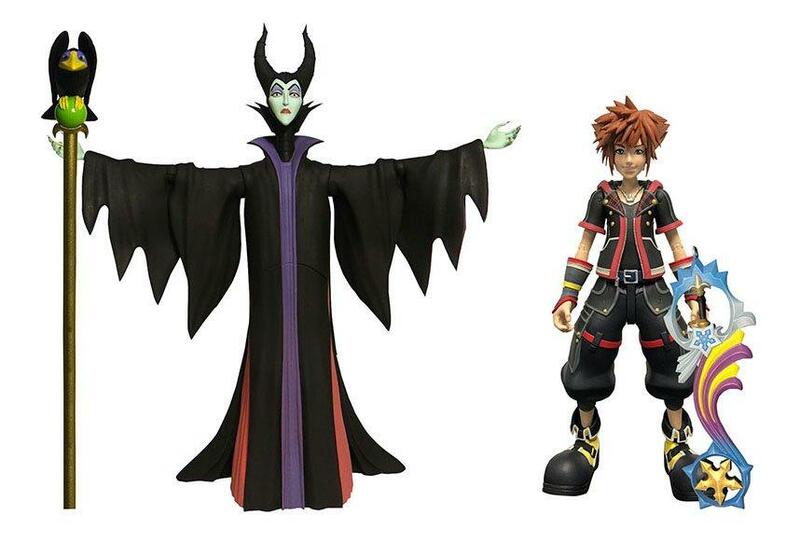 Also from Diamond Select Toys, Maleficent and Sora with the Shooting Star Keyblade figures will be sold as a double pack for $24.99. 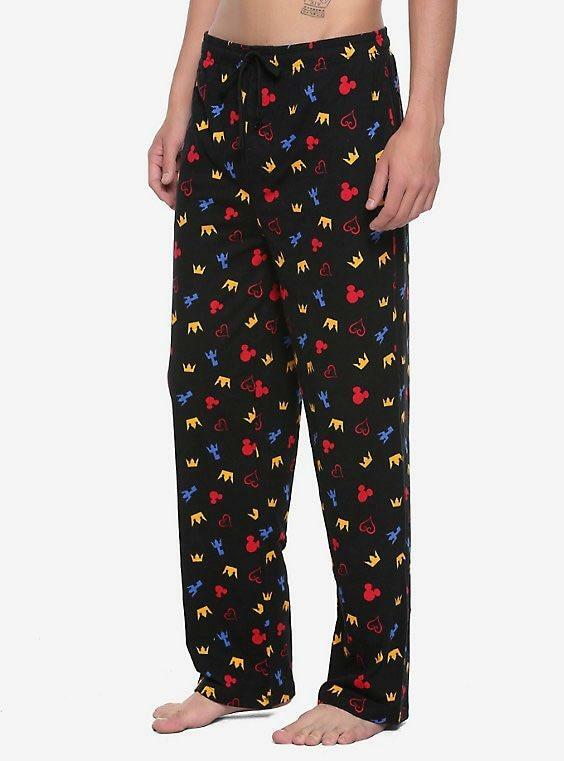 That's it for DST, now we jump back into clothing with Hot Topic's Kingdom Hearts icon pajama pants retailing at $15.92! These would go well with the throw! 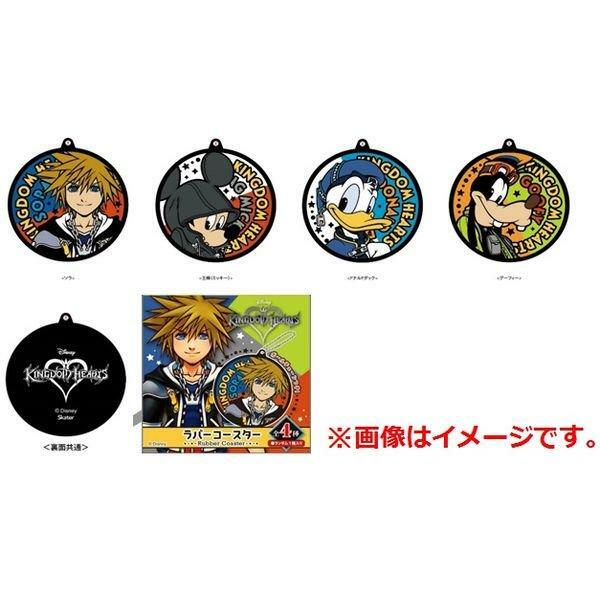 Bookwalker are releasing a Kingdom Hearts coaster set coming late January 2019, which will feature 4 coasters, one featuring Sora, one for Mickey, one for Donald and one for Goofy. There is currently no price specified. A set including both the coasters and pins will release alongside Kingdom Hearts III in Japan on 25/01/2019. 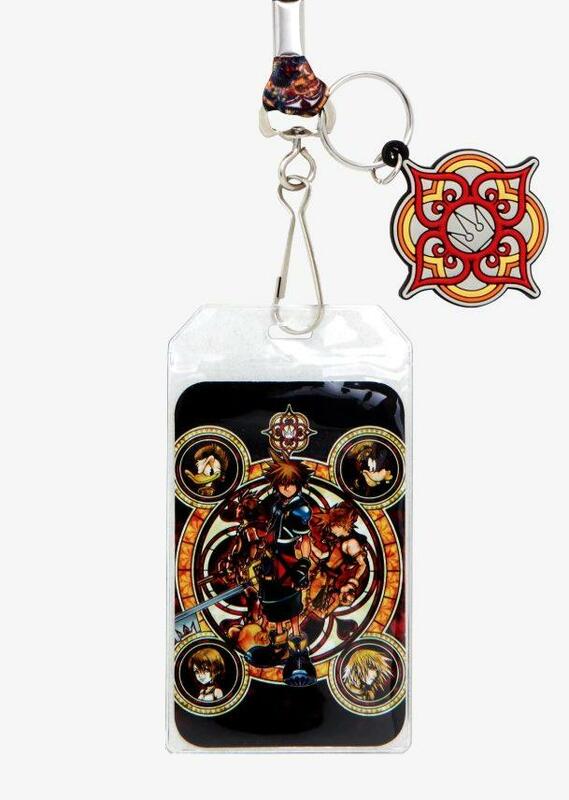 Again from Hot Topic, we have a new Kingdom Hearts lanyard featuring a "Dive into the Heart" stained glass design, costing $8.90 and a Kingdom Hearts symbols beanie costing $19.90. 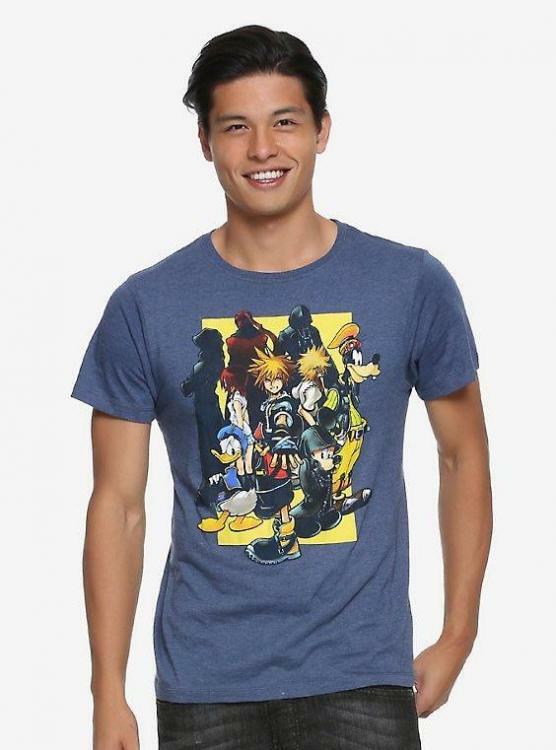 Box Lunch are selling 2 Kingdom Hearts t-shirt designs! A Light vs Dark design and a Photo design. Both designs are selling for $28.90. 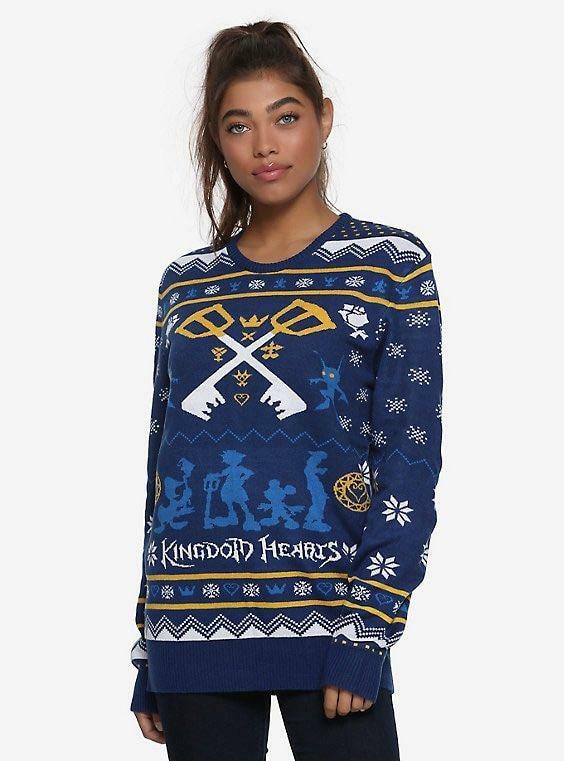 Also from Box Lunch is a Kingdom Hearts Christmas sweater going for $59.90. The final item from Box Lunch is a Kingdom Hearts Keyblade dad hat! 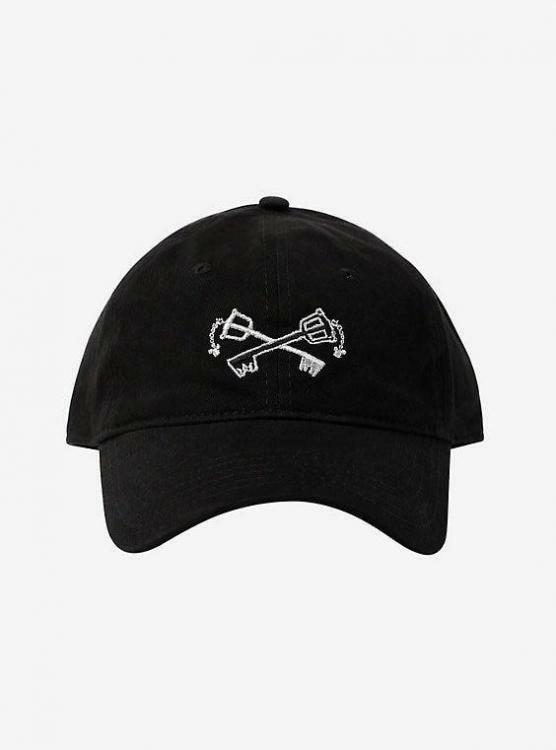 The hat costs $18.90. 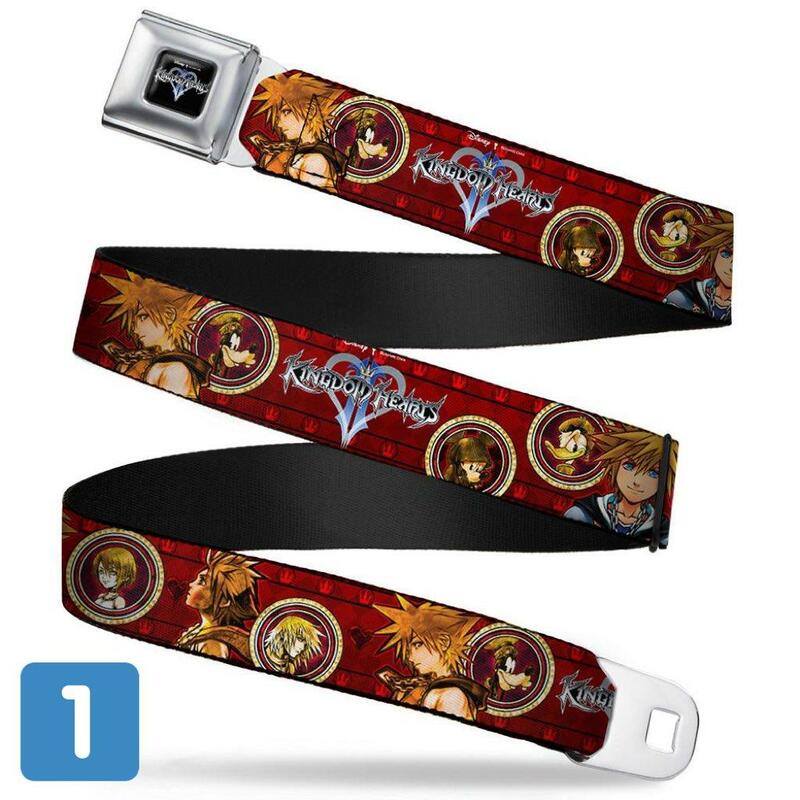 Buckle-Down Inc. have got some Kingdom Hearts belts for sale. 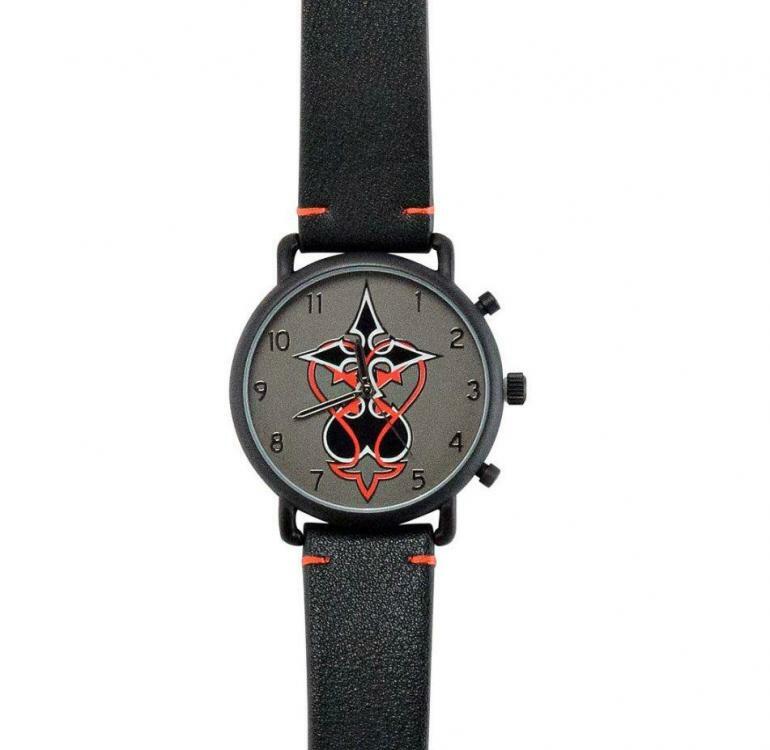 There are 5 different designs in total all retailing for $23.95! There's a Sora and Friends design, a 6 character design, a Shadow design, a second Shadow design, and a second 6 character design! It is yet to be confirmed whether these are licensed products. Spencer's have released 2 different Kingdom Hearts inspired watches. 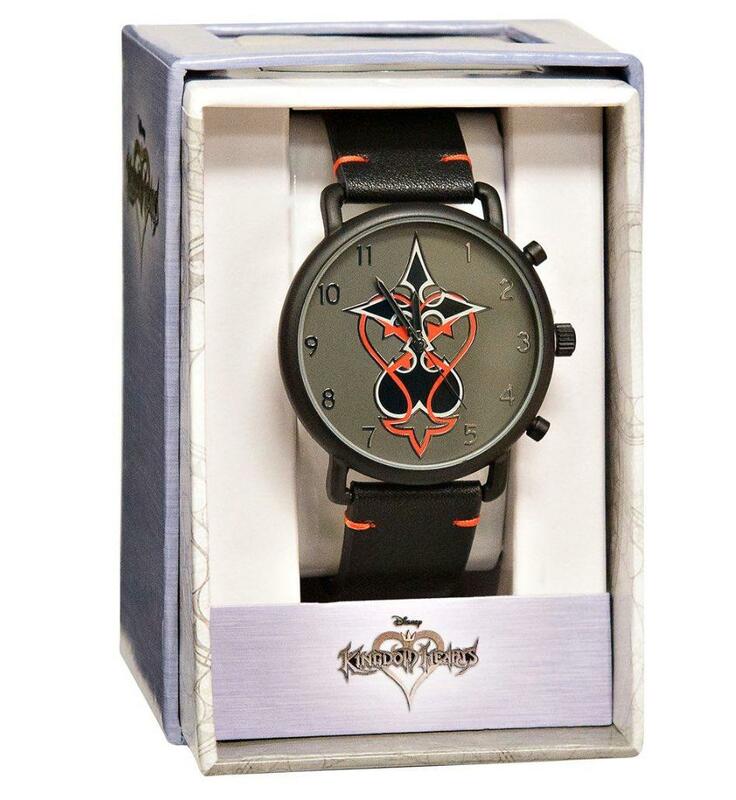 An LED watch with Keyblades on the strap and a watch with the Heartless/Nobody symbol on the face. 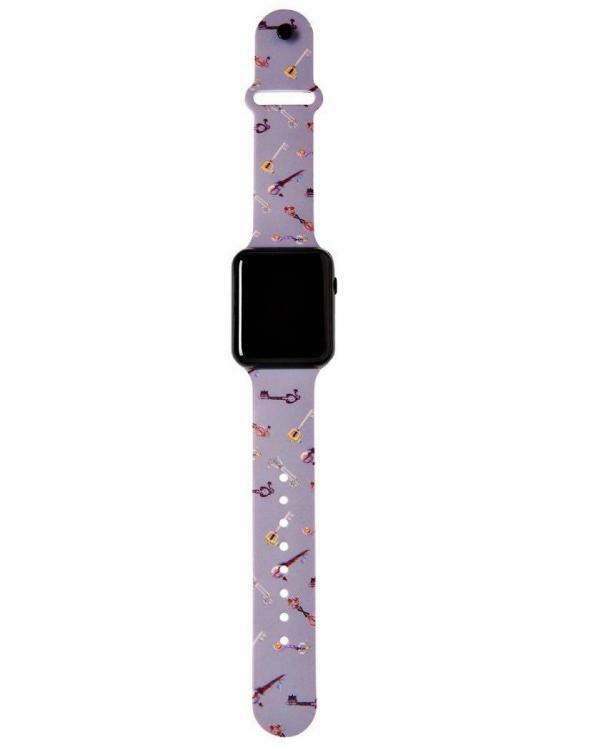 The LED watch is retailing for $14.99 and the symbol watch is $24.99. This merch round-up was a big one! What items caught your eye? Let us know in the comments below! \Welcome to KH13's analysis of the Tokyo Game Show 2018 Kingdom Hearts III live-stream footage! 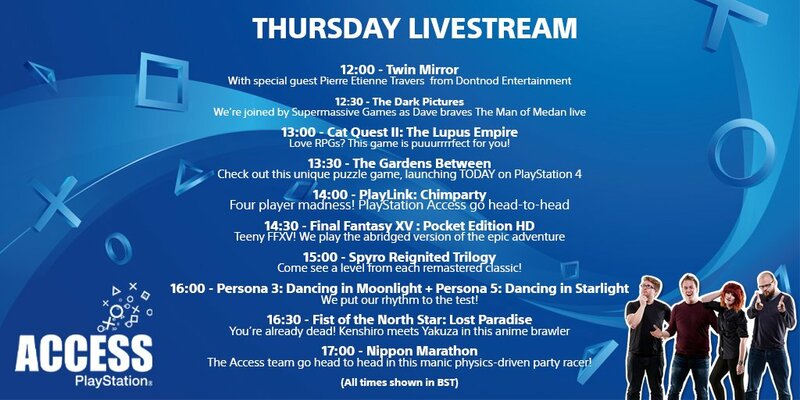 We will be analysing a total of 4 new pieces of footage shown live during the TGS 2018 live-streams; the extended look at Keyblade transformations, the extended Aqua scene and gameplay, the Toy Box boss fight and the full Arendelle Trinity Sled sequence. It goes without saying that there will be spoilers up ahead for those who haven't watched these extra footages. First up is the footage showcasing Keyblade transformations, link attacks, attraction flow and summons. The footage begins in an area within the Toy Box world which is filled with balls of different colours (something akin to a ball pit) which really showcases how improved the physics are compared to past titles. The first Keyblade transformation we see is that of the Infinity Badge Keyblade called Boost Hammer which interestingly changes Sora's coat red from black and is great for crowd control then it quickly switches to Monstropolis to show off the Smile Gear Keyblade transformation - Twin Yo-Yos. Like the Boost Hammer, Twin Yo-Yos changes Sora's design, this time changing from blue fur to yellow. The Twin Yo-Yos is a quick, versatile transformation, great for closing distances and crowd control in a dazzling fashion. The next transformation is the Assault Claws - a transformation of the Smile Gear Keyblade. 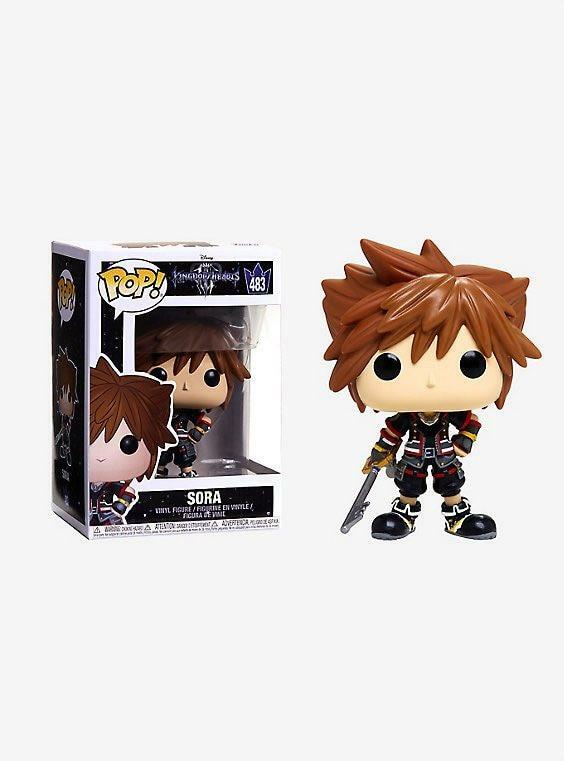 This transformation acts like boxing gloves for Sora to hit multiple enemies at once. We then see the yet to be named Arendelle Keyblade and it's transformation; Blizzard Blade. This transformation allows Sora to skate around the area and launch foes with spinning attacks. This then transitions to a ship in the Port Royal world and showcases the transformation of the currently unnamed Port Royal Keyblade. The 2 transformations are High Wind and Storm Flag. High Wind is essentially a spear type weapon that attacks long range and can also rain down pillars of light on enemies. Storm Flag is a flag (as the name might suggest) type weapon that is as flashy as it is effective, it can clear a group of enemies with ease. During this section of gameplay, the San Fransokyo Keyblade, which is yet to be named, is also shown, along with it's transformation; Nano Arms. Nano Arms has the ability to shapeshift through multiple forms, from a standard Keyblade, to a large hammer and even a rocket projectile that can be fired at enemies. The most interesting information given here is the ability to stack finishers. Once a finisher is ready, you can switch to a different Keyblade and get another finisher before unleashing them all consecutively, causing massive damage. 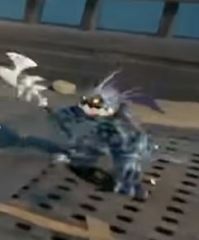 A thing to take note of is what appears to be a new heartless that resembles an amphibious creature with a spear. Next up is Attractions! The first to be shown is Merry-Go-Round which seems to pulse each time you time a button press correctly. This attraction flow is being shown off against the Ice Titan and the Lava Titan - the first time they have been revealed to the general public. They were first shown exclusively at the Kingdom Hearts Orchestra. We are then reintroduced to Tea Party Cup which has been shown on several occasions but this time we see that the finisher can actually be used on the balls in the Toy Box world. The final attraction flow shown is Splash Ride, this time shown in Monstropolis. The best point of attraction flow is it seems to render Sora invulnerable while it is active. Now we take a look at link attacks, starting with Baymax, whose link attack is called Intercept Jet. Intercept Jet allows you to fly aboard Baymax's back while swooping down at enemies while keeping them at a distance. Next up is the Toy Box link attack; Rodeo Rocket. This is activated by teaming up with Woody and Buzz, which then puts Sora, Woody and Buzz atop a large rocket that swoop and spin into enemies before activating the finisher which shoots the rocket off into the surrounding enemies. The final link attack shown is performed with Marshmallow in the Arendelle world. This link attack is called Avalanche Breath and much like Intercept Jet, it has you climbing aboard Marshmallow only this time you will be boxing your way to victory by swinging his claws. The next attack is hard to determine if it is a link attack or a finisher. Sora will grab mike in Monstropolis and bowl him straight into the enemies but the lack of a HUD and the fact it seems more like a movie that will play the same every time you do the attack, it feels more like it would be a finisher. Next, we'll dive into some of Kingdom Hearts III's summons. The first summon shown is Meow Wow; a Dream Eater from Kingdom Hearts: Dream Drop Distance. The summon is called Wonder Balloon. Once summoned, Sora will climb up on his back and bounce around causing damage to all nearby enemies. Once enough damage is caused, you can activate the finisher which will make Meow Wow drop onto his back and all the Dream Eaters from KH: 3D will come pouring out. 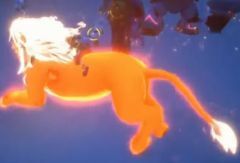 The second and final summon to be shown is Simba; a veteran of the Kingdom Hearts series. Simba's summon has the fitting name of King's Flare. This time, Simba is back with a twist - he more resembles a fiery phantom. His attacks all seem to be fire based and cover a wide area; with spinning attacks that cause rings of fire on the battlefield. Once your bar is full, you can pull off Simba's explosive finisher that hits a wide area with a large fire attack. We finally get a closer look at Gummi Ships next. It begins by showing something similar to a Kingdom Hearts II Gummi Ship route; flying along a fixed path while shooting all the enemy ships you can see on the screen. What's interesting is what come next - the ability to completely explore the routes between worlds! When free roaming, you will have a radar on the bottom left of your screen showing your surroundings in 360 degrees. Another thing that seems apparent with Gummi Ships this time around is the ability to attach a super weapon of sorts. On the right hand side of the screen is a bar labelled "weapon" which when full can be used to unleash a blast more powerful than any other cannon or laser. Finally, we take another look at the cooking mini-game with Remy from Ratatouille. We can see that Sora is being controlled by Remy pulling on his hair to control his arms. It seems as though you need to use the analogue stick to move Sora's arm, judging by the awkward motions used in the game. It would also seem like you need to press a button with the correct timing to make a good meal. The next bit of footage shows Aqua after she has succumbed to the darkness (whether she is Norted or just lost the battle for her heart is yet to be confirmed). When the camera pans out we see Sora stood opposite her in the Realm of Darkness wielding the Keyblade received in San Fransokyo. Due to Sora having obtained this Keyblade, we can assume this takes place after the Big Hero 6 portion of the game. Once the battle begins, Aqua begins using many attacks that are reminiscent of the attacks Phantom Aqua used in Kingdom Hearts 0.2: A Fragmentary Passage and because of this, it could further support the theory of her becoming a dweller in darkness rather than a Xehanort vessel. Aqua is also wielding a new variation of the Kingdom Key that seems like it has mixed with the Starseeker - both Keyblades that have been wielded by King Mickey. When Aqua teleports around the arena, a dark portal appears behind her - not too different from the corridors of darkness used by Riku and the Organisation members. It should also be noted that both Sora and Aqua are fighting while walking on water; something not seen in Kingdom Hearts thus far. The third segment of footage shown takes place in the Toy Box world. It shows off a new boss for that world and judging from the surroundings, it looks as though it takes place inside the Galaxy Toys area. 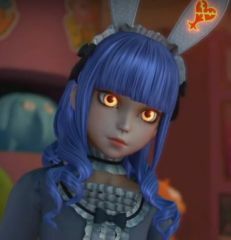 The boss is a new heartless type that resembles a maid doll with rabbit ears. On the right ear is a heartless symbol to show that it is indeed a heartless. The boss itself uses a variety of attacks, but mainly flies through the air, plummeting to the ground to hit the party with an area of effect attack before flying off again. Occasionally, it will land and perform spin attacks if you get too close. As well as the main boss, there are also miniature stuffed animal heartless continuously attacking the party along with various heartless and other toys. The final piece of footage is an extended look at the Trinity Sledge mini-game. This takes place in the Frozen world Arendelle. During this mini-game, Sora, Donald and Goofy are sledding down the side of a mountain on Goofy's shield, moving towards the camera, all while being chased by heartless. The heartless type seen during this mini-game is new and so far has not been named. It resembles an ice dragon which can dive at you as well as fire lasers across your path, leaving it up to you to dodge them. Once you evade the heartless for long enough, you are thrown into free fall mode with the opportunity to collect prizes on the way down. Upon landing, the camera has switched to being behind Sora, Donald and Goofy, and there are now ramps for you to jump over to get across gaps or just to collect more prizes. When you reach the end of the Trinity Sled mini-game you will need to fight 3 of the dragon type heartless. It seems as though this could be a mini boss considering each enemy has 2 and a half HP bars plus small health bars for each wing etc. During the fight, Sora is equipped with the Shooting Star Keyblade and uses the transformations for this Keyblade; Two Gun Arrows and Magic Launcher. The enemy itself generally stays above ground and will swoop at Sora and the party but it can also burrow underground and use its tail to swipe at the party from under the snow. What part of this footage did you find most exciting? Did you notice anything that we might have missed in our analysis? Let us know in the comments below! 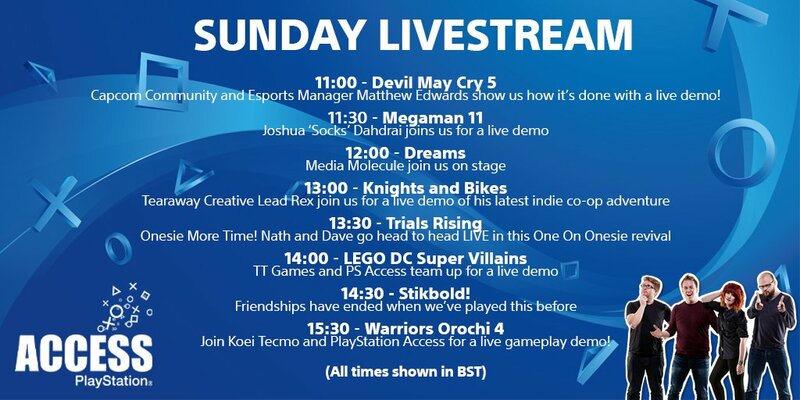 Playstation UK recently tweeted a live-stream schedule where they will be streaming from the PlayStationEGX stage for all 4 days. 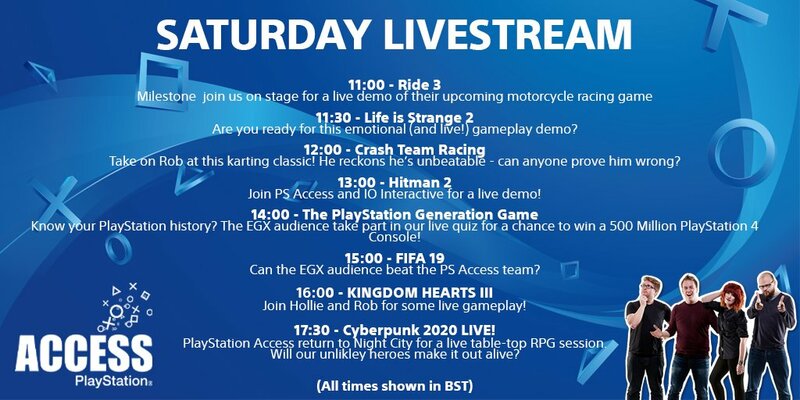 Kingdom Hearts III will be shown on Saturday. 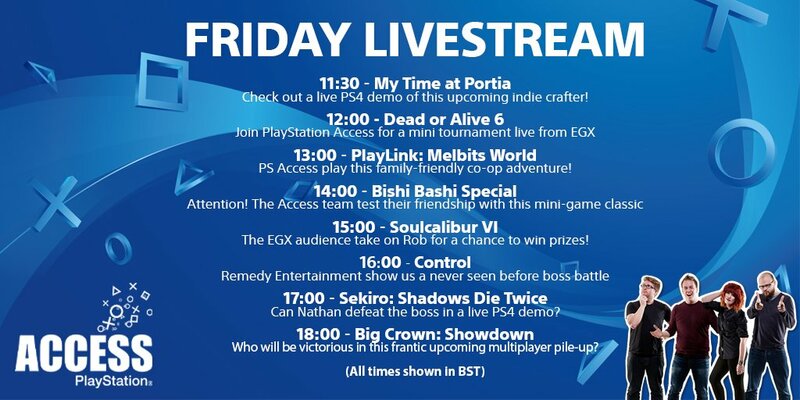 What are you most excited to see come from the EGX each day? Let us know in the comments below! Utada Hikaru - the artist known for her work on the Kingdom Hearts theme songs, will be performing the Kingdom Hearts III theme song "Chikai" for the first time at MUSIC STATION ultra FES 2018. This has been confirmed by her management, @Hikki_Staff on Twitter. MUSIC STATION Ultra FES is an annual even hosted by TV Asahi's "MUSIC STATION" which showcases Japan's biggest performers newest releases and will air September 17th. As well as performing "Chikai", Utada-san will also be discussing her new album "Hatsukoi" and reminiscing over her 20 year music career with presenter Tomori-san. [uPDATE]: You can watch Utada's performance at MUSIC STATION Ultra FES here. Are you excited to hear "Chikai" performed live for the first time? Let us know in the comments below! In a recent interview with Kingdom Hearts series director Tetsuya Nomura, conducted by Everyeye.it, Nomura spoke about the tone of Kingdom Hearts III as well as whether clothes will have an effect on the gameplay. Nomura also addressed why there are only English and Japanese dubs available for Kingdom Hearts III, how the selection of worlds are decided and expanded on the Gummi Ship portion of the game. Everyeye.it: It seems that every world is able to embody a different style and type of gameplay. Mount Olympus, Rapunzel’s forest and the Monsters, Inc. Factory show great verticality and ample spaces, in Toy Story everything seems focused on freedom of action (even driving mecha-style toys), in the Arendelle distances can be covered by speed-travel skiing with Goofy’s shield; in Pirates of the Caribbean, finally, we will have naval battles and underwater explorations. Talk to us about the process of creating each world and how you've come to translate these Disney realities into gameplay. Nomura: For this chapter, the development team put a large number of ideas on paper. Starting from the flow of proposals received from all the staff, I then added my personal ideas to ensure that the concepts achieved a certain [degree of] completeness. This does not mean that the ideas of the other developers didn't play an important role; indeed, when, originally, we began to select the worlds that we would have put [in the game], I personally asked each one of them to propose to me a presentation illustrating how each world should be played. The final selection, which of course rewarded the best ideas, of which Disney realities would be part of the final game took place on the basis of this criterion. Everyeye.it: Let's talk about the Gummi Ship. From the videos shown so far it seems to be the only feature that has not been particularly revolutionized. Can we expect any surprises, in this sense? How much space will this feature have? Nomura: In the first game, the Gummi Ship had a strong symbolic significance. In the second chapter [of the series], however, it ended up becoming a kind of amusement park attraction. This time, however, the space in which you can move the spaceship will seem much more expanded and very similar to the map of a role-playing game. Clearly we have added some customization options and re-proposed the shooting sections, which make the Gummi Ship what it is. But we also introduced a number of new elements thanks to a specific section of the development team that worked on it. Basically, the element of exploration is now much deeper. Everyeye.it: Regarding the localization, what are the times and the difficulties of the adaptation and translation of a work such as Kingdom Hearts 3, which collaborates closely with local franchises (Final Fantasy) and with a Western brand as important as Disney and the attached animation brands? Nomura: The biggest challenge is not so much the differences between the Kingdom Hearts franchise and other brands. When I direct a game, I ask for translations to be as direct and faithful as possible, no matter how complex the subject is. This implies the question of which of the two localizations (Japanese or English) is the best. The truth is that, especially for Kingdom Hearts, an incorrect or defective translation risks compromising the comprehension of the whole story, and this is why I care about it so much. On the other side of the scale, however, I also understand the dynamics that characterize the team's approach to the location of the game, which are quite complicated. After all, it is not an issue I can deal with firsthand, therefore I prefer leaving dealing with this problems to others. Thank you to KH13's Aquaberry for the translations! What do you think of the new information Nomura has given? Let us know in the comments below! A new interview with Kingdom Hearts series director, Tetsuya Nomura, has surfaced from Everyeye.it. The interview spoke about the tone of Kingdom Hearts III, Nomura's character design process and how outfits will affect the gameplay. Everyeye.it: KH3 will be, according to your statements, the darkest chapter of the saga, which will put Sora and the other protagonists in several dramatic moments. The series, however, is not completely new to large doses of pathos, so how are these statements reflected in the script? And, compared to the past, how difficult was the writing between the darkest introspection of the heroes and a plot that must draw the sums of a ten years old franchise? Nomura: The battle against Xehanort, which came to life in the first game of the series, will finally come to an end; moreover, since the journey Sora is traveling serves to alleviate the pain of having lost his friends in the past, the general atmosphere will be truly dramatic, at least in some phases, compared to the previous chapters. In actuality, I think the Kingdom Hearts 3 plot will not really be that grim after all. Neither the relationships between the characters, whether between the main ones or between the protagonists of the various worlds, nor the journey of Sora alongside Donald Duck and Goofy will be particularly dark. In fact, I will tell you: it could even tear out more laughter [in the audience] than in the past! In this sense, therefore, we could say that it will be a truly wide-ranging story, well balanced between the dramaturgical aspect and the comic one. 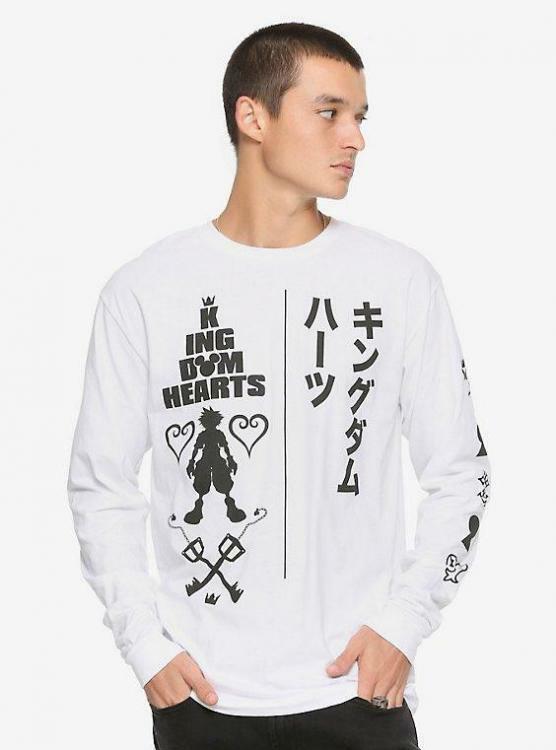 Everyeye.it: One of the predominant elements of the aesthetics of Kingdom Hearts are the clothes, real kingpins in the character design of each character and capable of amalgamating the cartoon style with that of Final Fantasy. How did you conceive the new character designs? What were the inspirations towards their realization? Nomura: Actually, I almost never get much from the character design process. Most of the time I find myself buying so many clothes that I like, I try them on and they inspire me. And indeed, there have been occasions, in the past, when I used some clothes I had bought for myself as character designs for some characters. A rather exhaustive example will be found in Kingdom Hearts 3 and concerns the look that Sora will have in the world of Pirates of the Caribbean: the design of his buccaneer jacket, in fact, is inspired by one of my coats! Everyeye.it: Even in previous games, clothes became a playful excuse to give life to the Drive Forms which, in terms of gameplay, gave enormous variety to the combat system and to the playful experience. 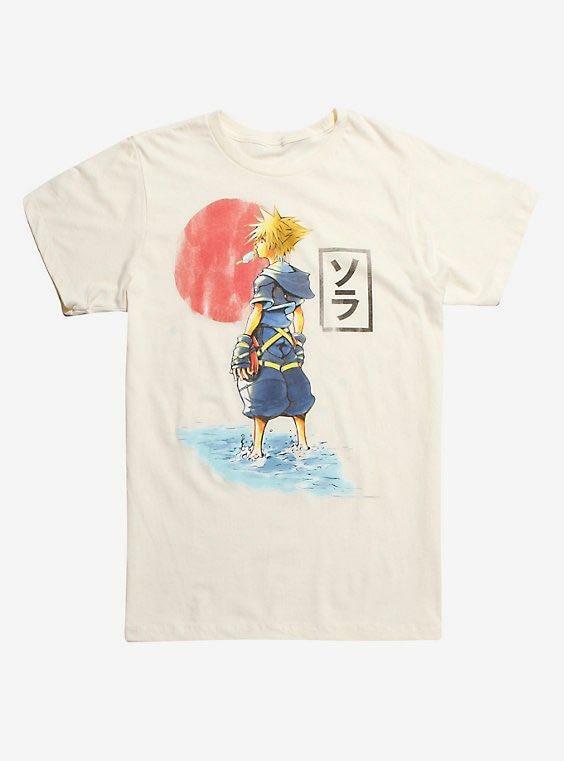 Will we find the same manic attention to the use of clothing in Kingdom Hearts 3? Nomura: No, this time the clothes of the protagonists will have no effect on the gameplay or on the combat phases, but the type of battle that you can manage will depend exclusively on the use of the Keyblades. The form they will take is the very representation of this novelty and will have no direct effect on the characters. Many retailers have began offering exclusive bonuses for pre-ordering Kingdom Hearts III from them. GameStop have jumped on the bandwagon and are now offering an exclusive replica of Monsters Inc Smile Gear Keyblade transformation in certain European territories. The bonus has also been spotted on GameStop Ireland, though only the picture is there and it does NOT say you will receive one with your order. Please be aware of this when placing your order! What pre-order bonus do you want the most? Let us know in the comments below! 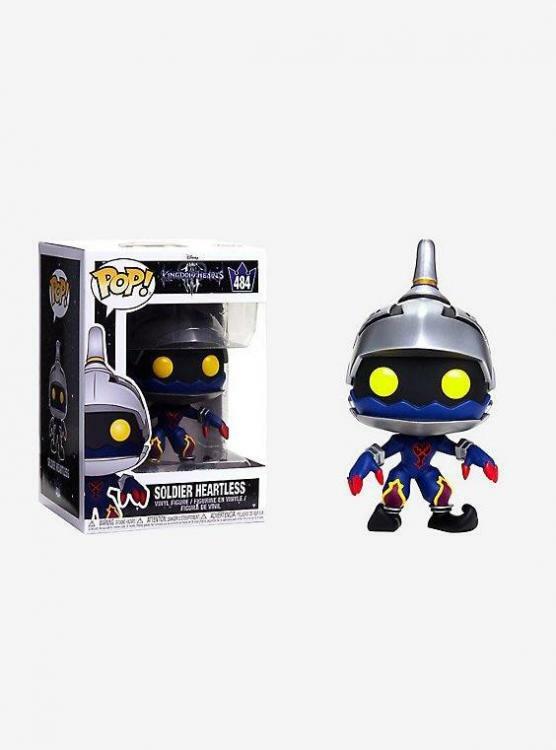 UPDATE [August 21, 2018]: The Kingdom Hearts III Smile Gear yo-yo pre-order bonus is also available at Game.uk! UPDATE [December 12, 2018]: The Smile Gear yo-yo pre-order bonus now available at German Gamestops! 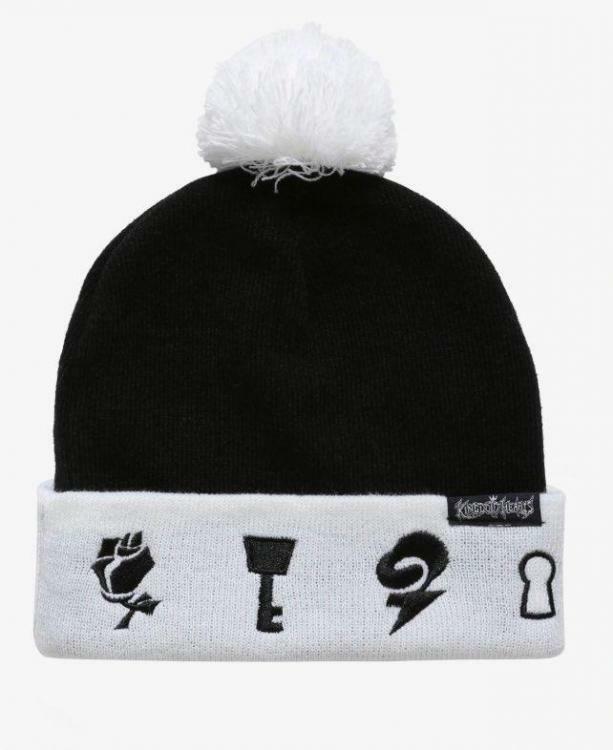 Can you provide the links for the Spencer's items? When I click the links in this article, they online take my to this hide me proxy site and not to the actual items. 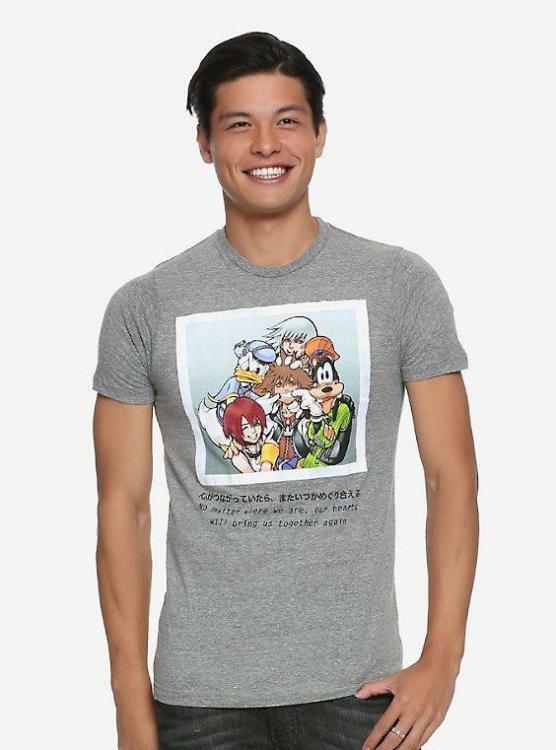 I also went on the Spencer's website but didn't see any of these items! Thank you! Ah, sorry to hear that, unfortunately the sites aren't accessible from the UK and so I can't link to the site without a proxy. I'll see if a different editor can fix the links. I'll keep you updated! 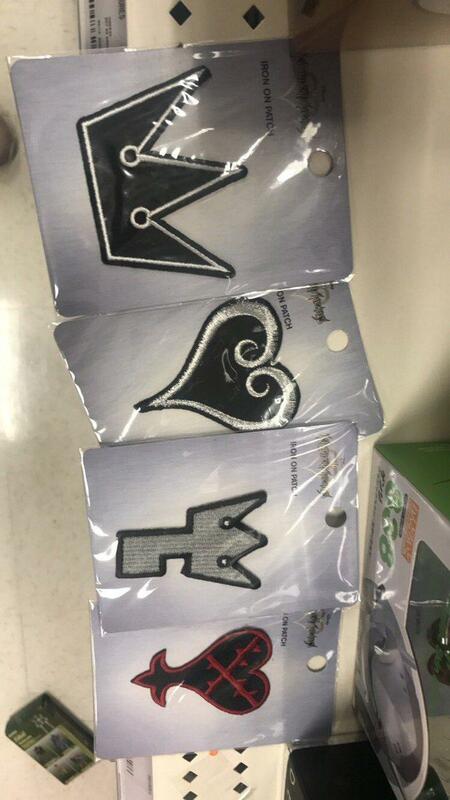 Various new Kingdom Hearts costumes and props have surfaced on the Spirit Halloween and Spencers Online websites. 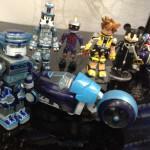 There are adult and children variations available for some of the costumes. Spencers are selling Keyblade props, these are; Mickey's Kingdom Key D, Pumpkinhead and, exclusively at Spencers, Oblivion. Spirit Halloween have both props and costumes available. Both props are also available at Spencers, these are; the Kingdom Key D and Pumpkinhead. Also available from Spirit Halloween are costumes; King Mickey's Organisation XIII robe - available in both adult and children sizes, an adult sized Kingdom Hearts II Riku outfit which includes a wig (pants and shoes sold seperately) and finally, a children's Kingdom Hearts II Sora outfit (Keyblade sold seperately). All the Keyblade props and children's outfits are retailing at $39.99, while the adult costumes are retailing at $49.99. Are you excited to dress up as a Kingdom Hearts character? Which Keyblade/outfit combo will you get? Let us know in the comments below! Pre-order bonuses are nothing new to Kingdom Hearts III, with special Keyblade skins and fabric posters being among the incentives already revealed. 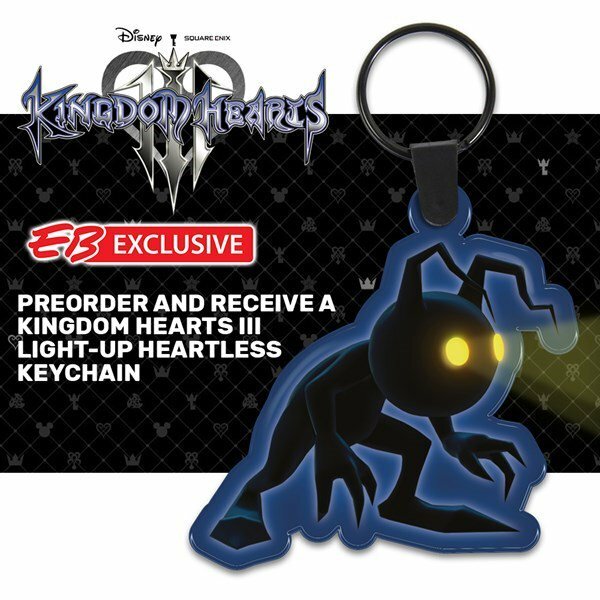 EB Games Australia have now joined the fray, offering their own bonus - a light-up Heartless keychain. 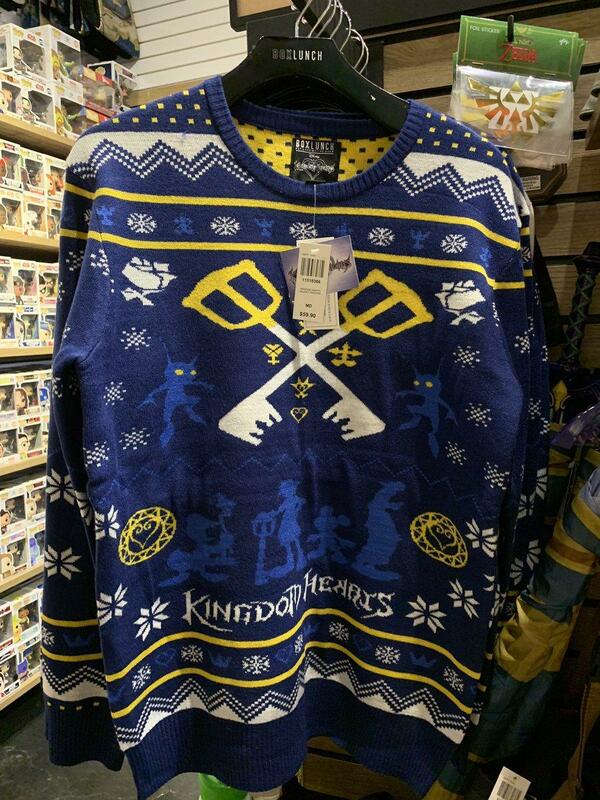 Has this changed your mind on where you want to order your copy of Kingdom Hearts III? What's your favourite pre-order bonus revealed so far? Let us know in the comments! Today marks the beginning of SDCC which will be running from 19th-22nd July. 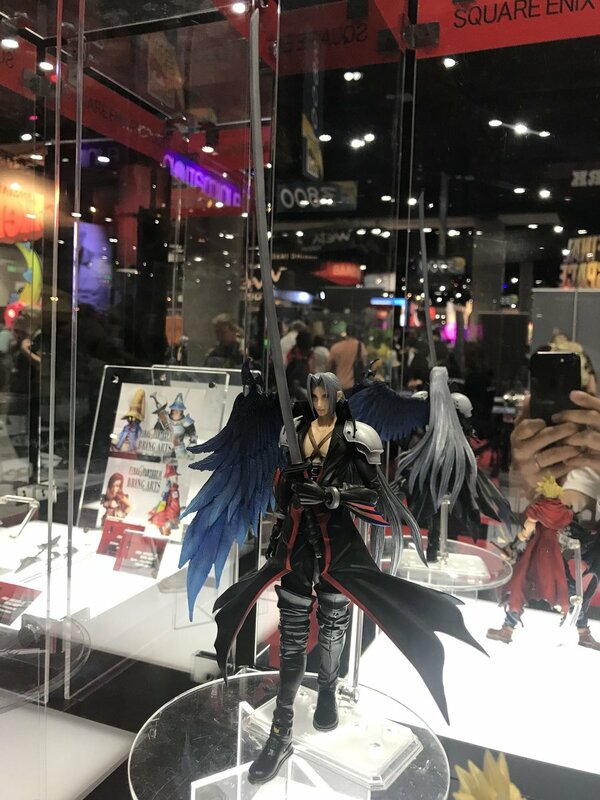 SDCC has already shown love to Kingdom Hearts by showing off recently announced Bring Arts and the playable Kingdom Hearts III demo being present. This isn't the only news of Kingdom Hearts in a Final Fantasy setting; in a recent data mine by Reddit user u/DeathChaos25, many new and/or unused files were found. This was then elaborated on by r/Dissidia moderator u/Tanuji who stated that Kingdom Hearts Cloud and Kingdom Hearts Squall both had outfits in the code. Although it's uncertain whether we will see these costumes come to fruition in DFFNT, it's definitely nice to see Kingdom Hearts pushing it's way into other Square Enix titles. What do you think of the new information? Are you going to get any of the new Bring Arts when they release? Let us know in the comments below! Being from the UK, I feel that pain.. I agree! That would have been my choice hands down. I chose Arendelle. 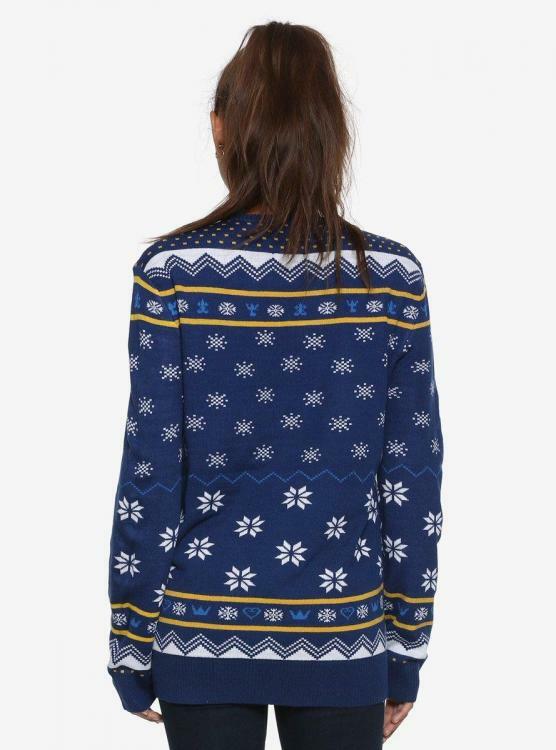 I can't help but think about the snow! Earlier today GameStop posted a poll on their Twitter account calling all fans to vote for their preferred Kingdom Hearts III pre-order bonus. This bonus will be exclusive to GameStop and the Square Enix store. The bonus will be 1 of 3 cloth poster variants. Each variant contains Sora, Donald and Goofy standing by a keyhole featuring a character from a specific world - Woody from Toy Story world ToyBox, Sully and Mike from Monsters' Inc. world Monstropolis and Olaf from Frozen world Arendelle. 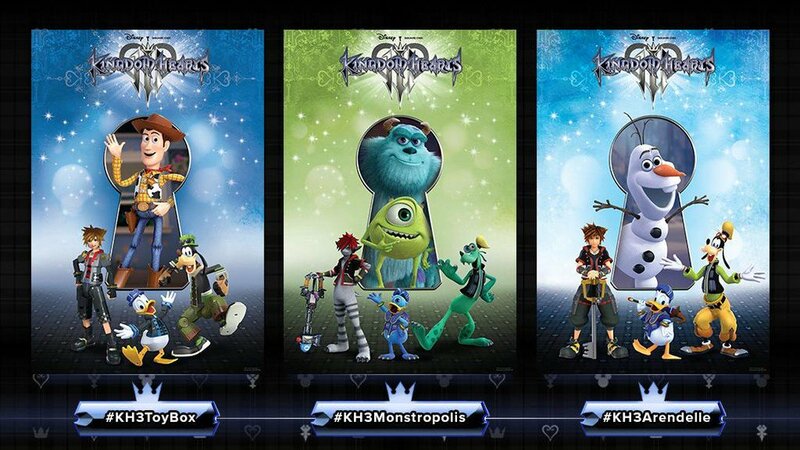 You can vote by replying to GameStop's tweet with the appropriate hashtag - #KH3ToyBox for Toy Story, #KH3Monstropolis for Monsters' Inc. and #KH3Arendelle for Frozen. Be sure to act quick to ensure your favourite is chosen! UPDATE: [Aug 1, 2018]: GameStop has announced the winner. 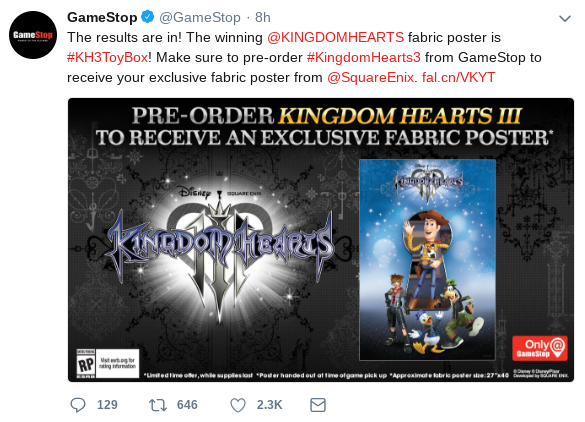 The fans have chosen the Toy Box fabric poster for the GameStop-exclusive pre-order bonus for Kingdom Hearts III. Thanks to all that voted! 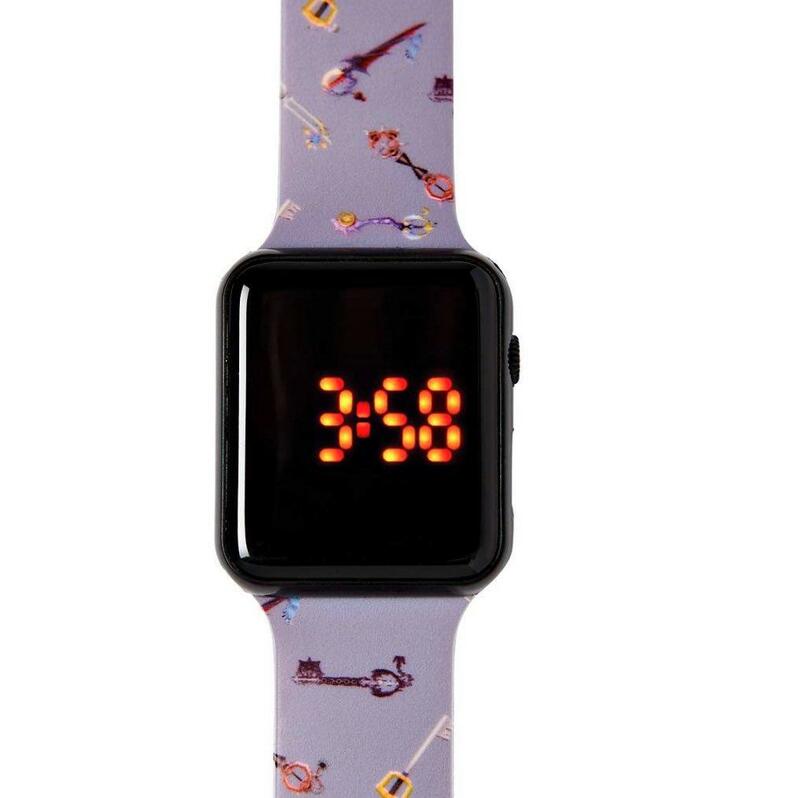 UPDATE [Aug 10, 2018]: EBGames Canada are also offering the Toy Story fabric poster as a pre-order bonus for the standard and Deluxe versions of Kingdom Hearts III (for both PS4 and XBox One) while stocks last! Everglow continues retelling of Kingdom Hearts and A Fragmentary Passage in KINGDOM HEARTS TIMELINE series episodes 35-41! It certainly is an amazing feat. Telling the story in a chronological sense is confusing enough without doing it on such a grand scale! 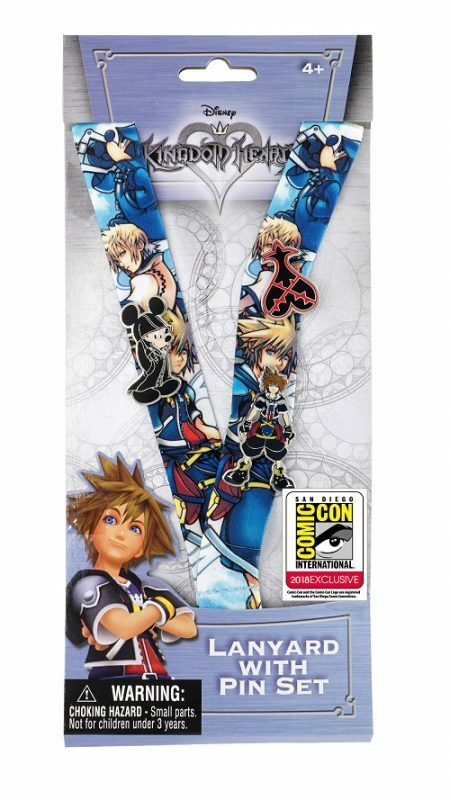 A new limited edition Kingdom Hearts pin and lanyard set has been revealed for sale exclusively at San Diego Comic Con - taking place from July 19th - 22nd, as posted by Disney Pins Blog. The set will retail at $15 and be very limited, having only 400 available. 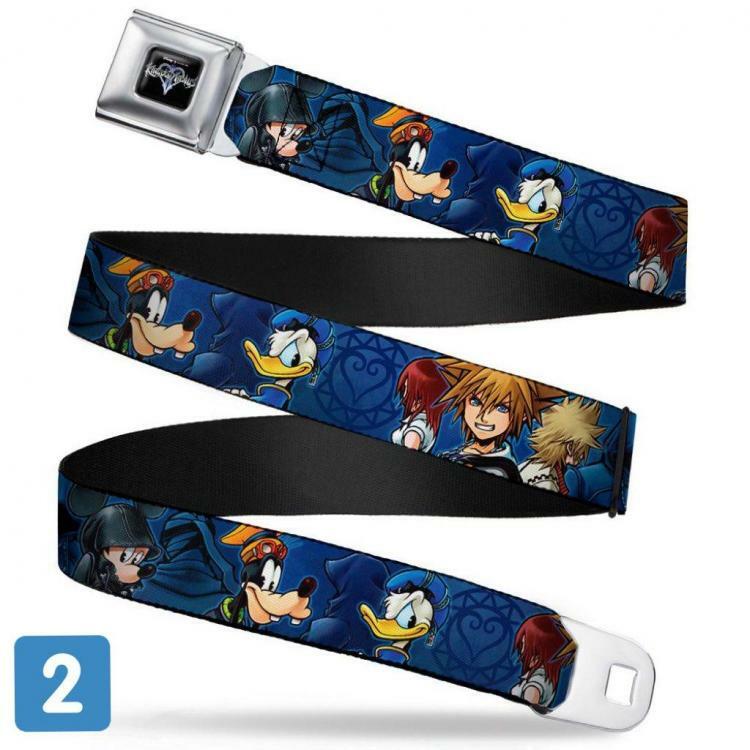 The lanyard features art from the box of Kingdom Hearts II and is adorned with 3 pins - Mickey wearing an Organisation XIII coat, Sora in his Kingdom Hearts II attire and a Heartless logo. 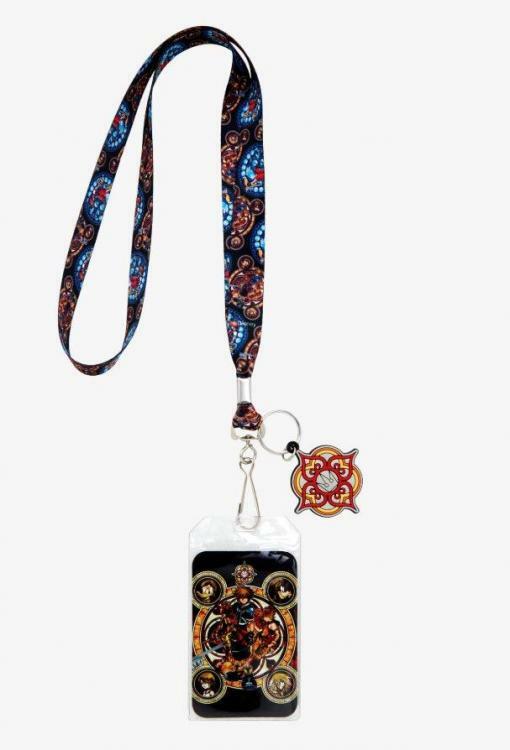 Are you going to be at SDCC and grab a lanyard set? Let us know in the comments below! This time around we see Sora meeting Leon and Yuffie in Traverse Town before switching perspective to Aqua - who is still stuck in the Realm of Darkness. We see Sora finally meet Donald and Goofy before embarking on their adventure. On their travels; Sora, Donald and Goofy travel to Wonderland, Deep Jungle, Olympus Coliseum, Agrabah and finally, Monstro, all while Aqua traverses the Dark World learning more about Terra's fate - and slowly losing herself to darkness. Everglow's KINGDOM HEARTS TIMELINE series is an in-depth chronological recap of the entire Kingdom Hearts series; masterfully compiled to give you all the knowledge you need in the run up to Kingdom Hearts III. You can find Everglow on Twitter and YouTube. Be sure to subscribe to Everglow for the latest episodes!